Thinking about recess before lunch? These resources will help. As you may know, I’m a retired principal but I’d be the first to admit that changing the education system is a lot like turn a huge cruise ship in a small harbor. Possible but not probable and it requires lots of maneuvering. However, a few brave principals across the nation are doing just that and bringing a long standing school tradition to an end. They are advocating recess before lunch. And in doing so they are getting some amazing results. Kids eat more, waste less food, return to the class calmer, behave better and as a result, instruction time is increased. 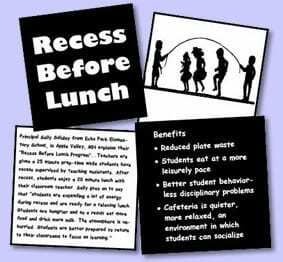 You might be wondering, “So exactly what is recess before lunch?” Basically, it is where kids go to recess first and eat lunch later. I’ve prepared a short PowerPoint presentation to go along with this article and in that presentation, I talk about the benefits of Recess before Lunch. Calmer more relax students in the cafeteria. Students returning to classroom calmer and ready to learn. Students throw away less food. Let’s hear what a couple of principals have to say about recess before lunch. Principal Peters from McKinley Elementary School in Tacoma, Washington observed the following results from the recess before lunch program. Teachers too were asked about how Recess before Lunch was working in their schools. “We have more uninterrupted teaching time,” one teacher commented. “There are fewer fights on the playground and we’re seeing better classroom behavior.” Teachers acknowledged that they had observed that students are not rushing through lunch to get to recess anymore. Principals also voiced their need for hard research before implementing a new program like Recess before Lunch. Here are some research results from studies that identified some of the benefits. Children ate 24% more food, wasted 30% less food, consumed 8% more calories, consumed 35% more calcium and 13% more vitamin A. The Podcast is now available in the Free member’s library. Download: Research Paper –Now available in the Free member’s library. Recess Placement Prior to Lunch in Elementary Schools: What are the Barriers? Now available in the Free member’s library. 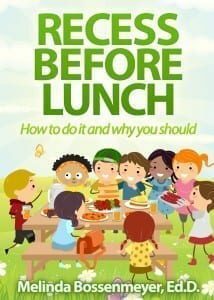 The next section of this article will provide you with some online resources to consider in making your decision and also some suggested steps to follow in implementing a Recess before Lunch Program. 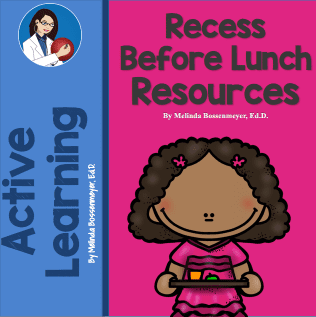 For additional resources on Recess before Lunch programs visit Recess before Lunch: A Guide to Success , at the Montana Team Nutrition Network. Recess Before Lunch Can Mean Happier, Healthier Kids from Education World’s Administrator Center includes ideas for making the change to recess before lunch. For a deeper dive into “Recess Before Lunch” visit our Member’s Library. It’s FREE.